​Yin yoga poses apply moderate stress to the connective tissues—the tendons, ligaments, and fascia—with the aim of increasing circulation in the joints and improving flexibility. A yin practice is meant to complement a yang practice, or more vigorous forms of exercise. Yin postures are passive, long-held postures wherein the muscles are relaxed so that the pose can work to go beyond stretching the muscle and works to get deeper within the body. 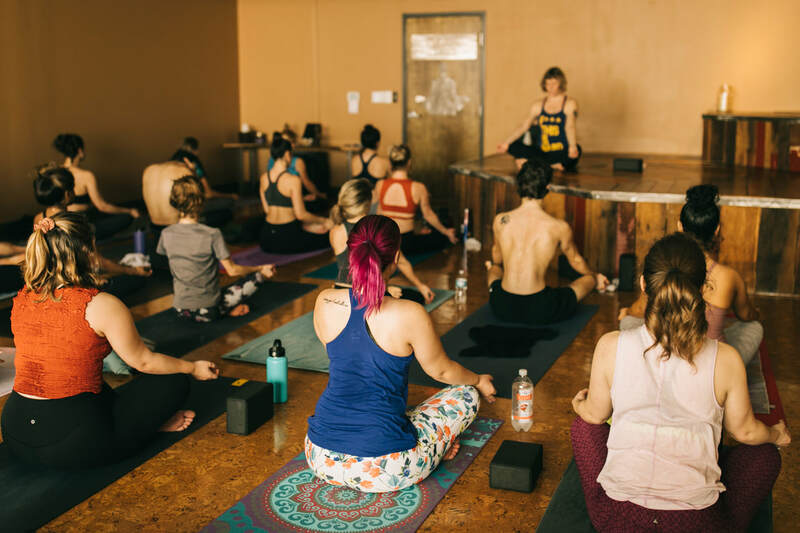 Come learn more about the Yin Yoga practice and it's benefits during this two (2) hour workshop with Amanda. ​Come out and support our Demystify Yoga Teachers in Training during their Final Practicum(s). Classes are FREE and open to the public. Plan to arrive to classes 10-15 minutes early. Classes are first come, first served. We have yoga mats available to borrow, if you bring your own yoga towel! Otherwise, a yoga mat/towel rental is $3.00. *FREE Classes - First Come, First Served. ​The Sanskrit word Chaturanga Dandasana means Four Limbed Staff Pose. This is one of the most elusive transitions/postures of the Ashtanga-Vinyasa tradition. Understanding the anatomy and alignment of Chaturanga Dandasana is essential to both practicing and teaching Ashtanga-Vinyasa Yoga. Chaturanga Dandasanda is not a beginner’s posture. It is important that you are keeping your shoulders safe during strength training drills and in the full execution of this pose. Join Amanda T. and Lil S. for a thorough break-down and posture clinic! ​Enjoy a Hatha style yoga practice focused on guiding you through the main chakras of our energetic anatomy. Each chakra represents an anatomical reference point in our physical body and a metaphysical point in relation to our mind, ego, and current life situation. This practice will include various types of pranyama (breath work) to find balance and harmony in the body. The practice will include a 15-30 minute sit/meditation. This workshop is intended for beginners, more advanced practitioners, and teachers alike. Taking part in an all levels workshop will allow yogis full exposure to safely learning, exploring, and teaching these advanced postures. This workshop is eligible for YACEP credits. The arm balance and inversion workshop will consist of a vinyasa practice containing bakasana (crow) variations. After warming up we will safely explore entry into chaturanga-based and open-hip arm balances. With this strong basis, we will work from the ground up, exploring exercises building up to entry into different variations of headstand. Come out and support our Demystify Yoga Teachers in Training during their Final Practicum(s). Classes are FREE and open to the public. Plan to arrive to classes 10-15 minutes early. Classes are first come, first served. We have yoga mats available to borrow, if you bring your own yoga towel! Otherwise, a yoga mat/towel rental is $3.00.